Here is a thread to share current releases, work in progress and the roadmap of the tools I'm slowly (but surely ! ) building with only one distant goal in mind : to play whole new Shining Force adventures ! A few months ago I wanted to explain the whole creation process I have in mind with tools deduced from the game's data structures, and then I got lost into real life again, so this time I'll just make a quick list of existing tools and enrich the original post later. These tools are intended to be used on the game's disassembly, not on the ROM directly. Current and future "low-level" tools may allow to work on ROMs when possible, because handling basic assets is still feasible quite easily, as long as original data length is not exceeded. However, direct ROM hacking is not flexible enough to handle "high-level" data structure editing. This is why most future and more complex tools will work exclusively with a disassembly. Some people may find it harder to use than just hacking a ROM file, but this is well worth the effort. The sonic hacking community is the best example there is to show how powerful this approach can be. With the disassembly, anything will be possible. We're the developers now ! Please note that all of these tools also work as Java APIs for anybody to include them in their own tools. Uncompressed data processing. Easy part but good first use case to establish the whole import/export process with a defined PNG format. Basic-compressed data processing for map sprites. - Add layout file import ? 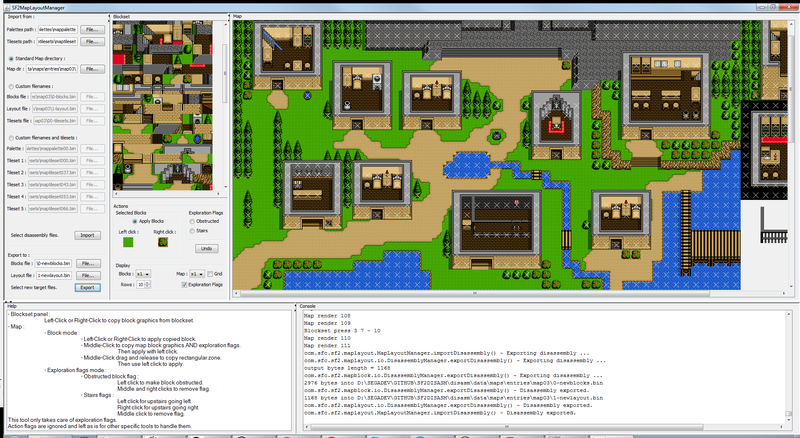 - Add import/export functions for a specific Tiled-Map editor, like Tiled ? Implies to use "4 bits per pixel" PNG format with indexed 16-color palette and transparent color at index 0. Make sure your image editor keeps this color mode when saving, or else PNG import may not work properly. - You can re-arrange icons by changing their filename index. Just make sure they're all named "iconXXX.png" with decimal value and no missing number between two entries. Can also be used on Shining Force 1 ! Icons offset : CF0EA including spells first, or CFCEA for items only. Icons length : 15552 including spells, or 12480 for items only. So SF1 and SF2 icons can now be freely edited and/or swapped between each other. Beware though ! SF1 and SF2 base palettes are different, so swapping can imply some palette tricks. You can also combine the source game's icons file with the destination game's palette file by using the Disassembly import feature. I won't take the time to work on making it compatible directly with ROMs as it's not my main target. However, anybody is free to contribute by adding this feature. The tools' code structure should be clear enough to make it simple to add. Just make sure to manage the whole map sprite pointer table to avoid data overriding ! 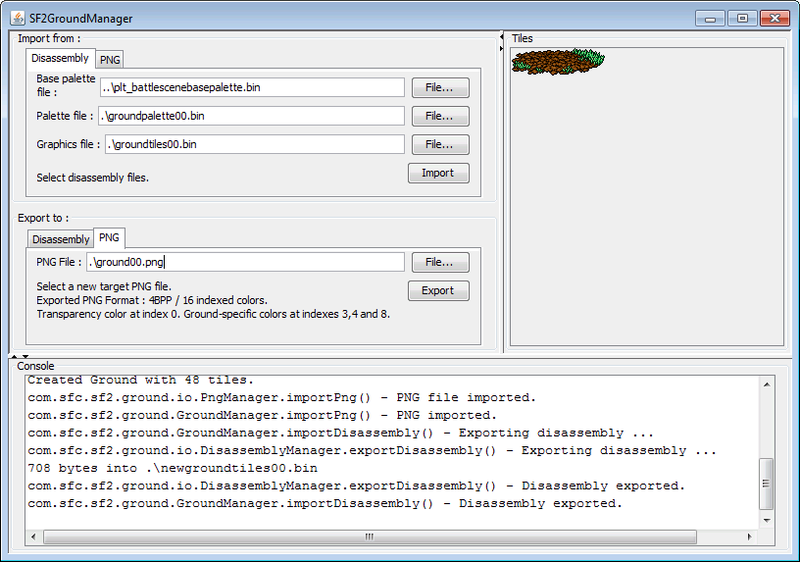 Import/export functions from/to disassembly binary files, and PNG files. Imported PNG files have to be "4 bits per pixel" with 16 indexed colors (no transparent color), and a 256*96 resolution. Imported PNG files have to be "4 bits per pixel" with 16 indexed colors (transparent color at index 0), and a 64*64 resolution. 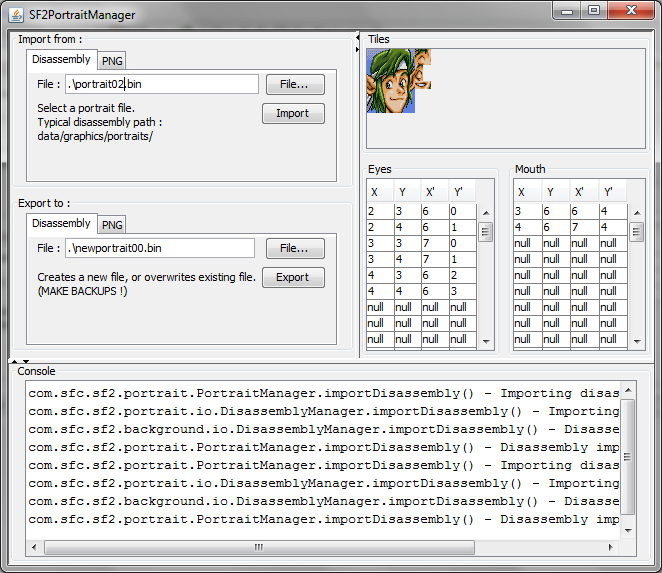 Eye/mouth tile data can be edited from the GUI and then saved into a disassembly binary file. However, they cannot be stored in a PNG file. - either import PNG and then write data manually. - or import an existing disassembly file first, and then import PNG file : eye/mouth tile data from disassembly file will remain loaded and you can edit them. 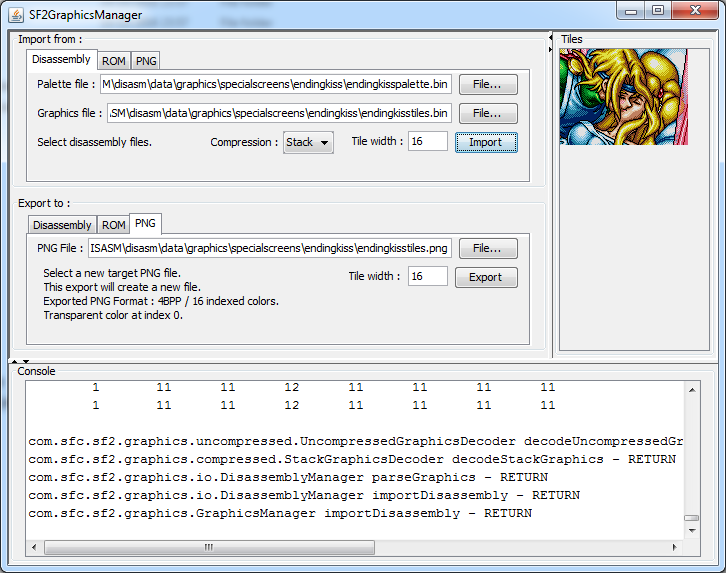 Import/export functions from/to disassembly binary files, and individual PNG files. Imported PNG files have to be "4 bits per pixel" with 16 indexed colors (transparent color at index 0). Unknown word value still to figure out, any help is welcome ! Imported PNG files have to be "4 bits per pixel" with 16 indexed colors. - Index 14-15 -> 2 specific colors picked from the weapon sprite palette entries. TODO roadmap with future tools to give a global view of the tool suite architecture. Last edited by Wiz on Wed May 09 2018 8:15pm, edited 21 times in total. Is there a good online tutorial on how to read and reassemble disassembly? It's not so intuitive after all ... and I must admit I didn't take the time to write it down in details. with build/build.bat, assemble the game from its disassembly and the extracted data chunks The assembled game will be perfectly identical to the original one. 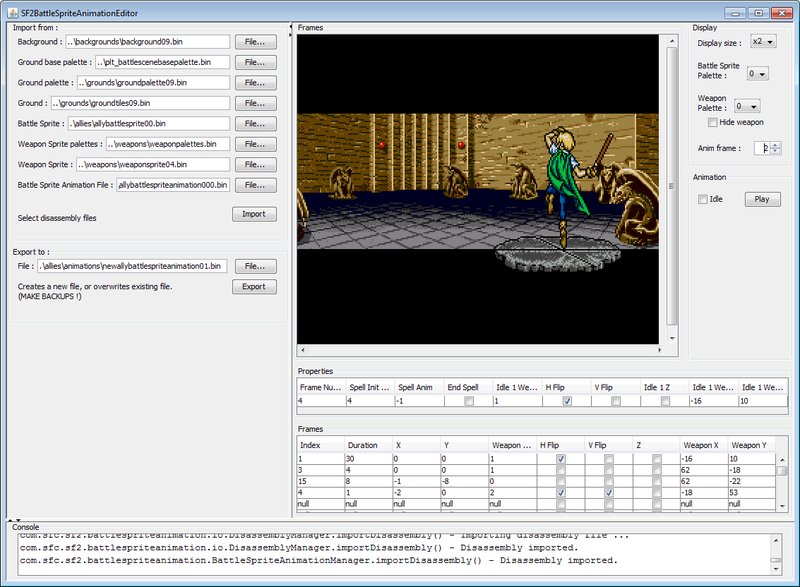 - Also put sf2.bin into the build/ directory, as a comparison reference for new builds. With the original content of disasm/, the resulting ROM file is supposed to be a bit-perfect replica of sf2.bin, hence the comparison at the end of the build to make sure of SF2DISASM's integrity. Please guys tell me if that's enough instructions here, and then I'll put it in the original post. This is the generic low-level layer for read-decode/encode-write functions, for any type of graphical data, compressed or not. This layer manipulates graphics data as an array of 8x8 tiles associated to a palette loaded with SF2PaletteManager, which is included as an API. But we're still very far from that, and I'm really slow compared to rubixcuber or BNC, so we're talking about years of good use of my precious free time here. Don't expect anything near the Caravan's possibilities anytime soon ! Thanks for the further information Wiz. I was actually talking about understanding what each chunk actually means, though. For example, is there something I can read that would explain what each of these lines mean? Oh I see, you mean how to read assembly language, ASM 68K here. - A general overview of assembly language : the CPU's basic instructions to manipulate registers and memory locations. - A specific overview of the Megadrive's hardware architecture around it's CPU : Motorola 68000. - And then a reference to ASM 68K's language in the Megadrive's context : specific registers and memory addresses. - ... And then, I should do a specific introduction to SFII's ASM, with a global view of the game's execution flow (main flow and technical interrupts after every frame), and detailed examples. ... actually, this deserves its own thread ! Not sure about when I'll have the time to do that, but I'll definitely do it if it can help people not to get too intimidated by the technical aspects of the disassembly ! I probably don't have time right now to understand a full rundown, unless it is as complex as I expect it to be (though I won't say no to it being available -- I just don't want to feel guilty that I'm not taking advantage of it immediately). What I'm looking for now is more just enough to make basic sense of what I'm looking at and the ability to identify simple changes. For example, I would like to make it so that items always cracked on first use, but auto-repaired after battle. The first would be reasonably simple to do, I would think, and for all I know the second may not be as difficult as imagined. But getting some frame of reference for things like that would be helpful. Hopefully that makes sense. Most graphics can now be edited with the proper use of this editor, which can be more or less tedious depending on what you want to edit and how. Then I'll think about map tilesets and map content more globally, when the time comes. For example, if I wanted to pull out the endingkisstiles-"picture" of the ROM as displayed in the image above, what would I have to do? I am assuming "entering the correct palette/graphics offset data" before importing, but if so, how do I know these? - Either keep the classic ROM approach and apply specific offsets and lengths, which you have to know indeed. - Or use a disassembly as explained in my first post, and open binary files containing graphics data. Icons are not compressed, map sprites use basic compression, and almost everything else use stack compression : map tilesets, title screen, witch screen, battle sprites, battle scene backgrounds, grounds, weapons, etc. But even when you know this, another aspect comes into play : tile layout. Depending on graphic assets, the tiles will not be arranged in the same layout. This is something that SF2GraphicsManager is not managing, as it only loads graphics as an array of tiles. You can input an image witdh (in number of tiles), but in most cases this will not be enough, as tile layouts can be quite complex. 2 6 10 14 50 . 194 . 3 7 11 15 51 . 195 . 4 8 12 16 52 . 196 . You can always export those tiles in PNG files if you're able to work on them like that, but that's not really practical. Actually, the ending kiss graphics are just a lucky find : they are stored in a very simple way, which explains why they appear properly arranged here. ... so yeah, unless you know what you're doing, you may prefer to wait for more specific tools ! Just be aware that these specific tools will be disassembly-oriented only. And talking about specific tools ... 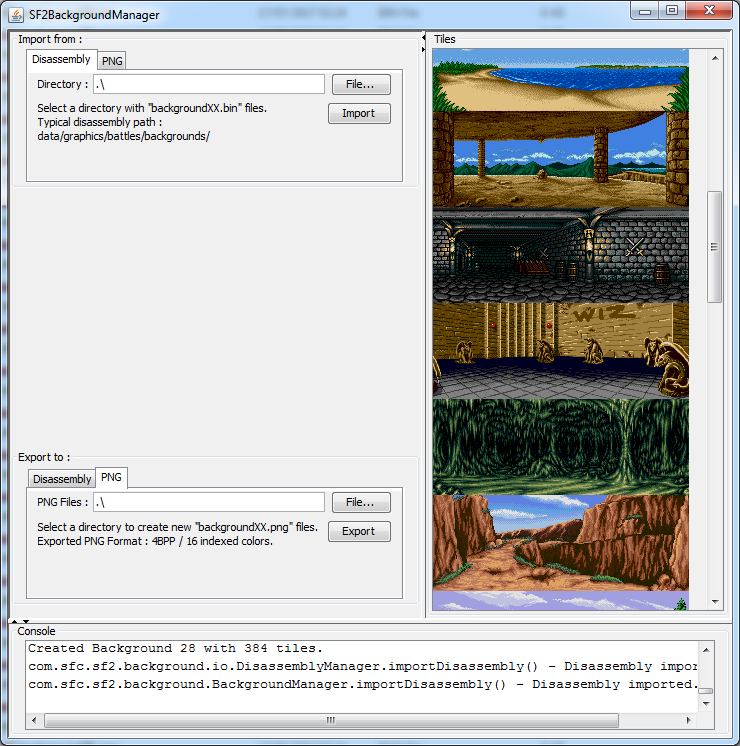 I just uploaded SF2BackgroundManager. OP updated ! Last edited by Wiz on Mon Jul 17 2017 1:10pm, edited 1 time in total. welp, then I guess I will have to learn how this disassembly thing works sometime. Thanks for your explanation! build.bat : builds a bit-perfect replica of the original game. This acts as a non-regression test when SF2DISASM is updated, but you can also use it to build modified 2MB ROMs if you want. buildexpanded : builds a 4MB ROM with most data structures moved to get a lot more free space. SRAM bankswitching is managed. I'll probably start SF2BattleSpriteManager next while I'm on graphic stuff. Now we can change the blinking and talking animation? How dummy friendly it will be to use these tools? Yes, now you can ! But I'm afraid my tools will never be "dummy friendly" as you said. At the moment I'm only focusing to make stuff work, with only very basic ergonomic features. So for this portrait GUI, no fancy eye/mouth editor or previews at the moment, only the raw data you can edit when you properly understand it. Eye tiles and mouth tiles are a list of portrait tiles that are swapped with alternative tiles. X/Y represent the original portrait tiles coordinates with 0/0 being at the upper left side of the portrait. X'/Y' are the alternative tiles coordinates. Alternative tiles are stored from coordinates 6/0 to 7/7, so each portrait can have up to 16 alternative tiles shared between eyes and mouth. You can create new tile entries in the list by editing the next line having "null" values. You can also remove entries by removing integer values. But valid entries have to be in consecutive order from the beginning : for both lists, the editor will stop exporting entries at the first invalid one (valid : 4 integer values). I see, its good enough for me. I think if you make a help file explaining the more complex stuff it will help a lot. Im really happy with all the progress. 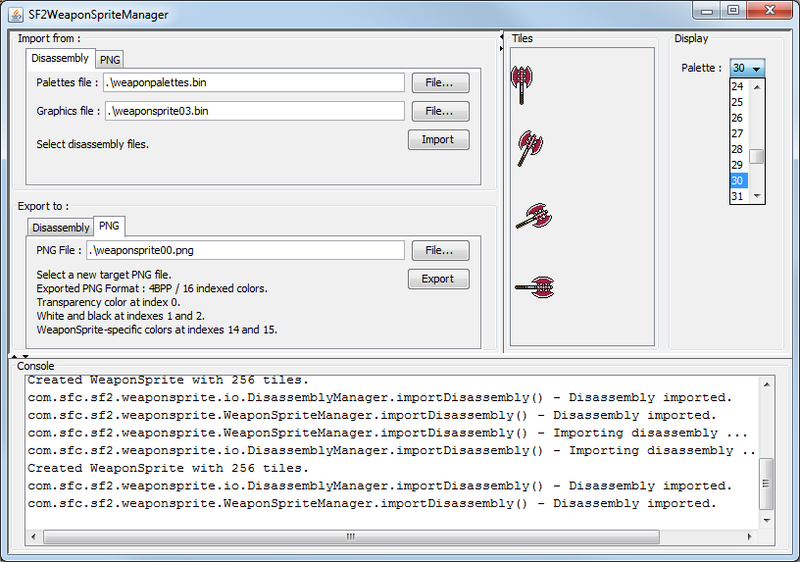 All this managers will allow import features to the game, like new weapon sprites or just edit existing ones? They simply allow to work on individual assets by converting them from the game's binary format to a more editable format, and vice versa. 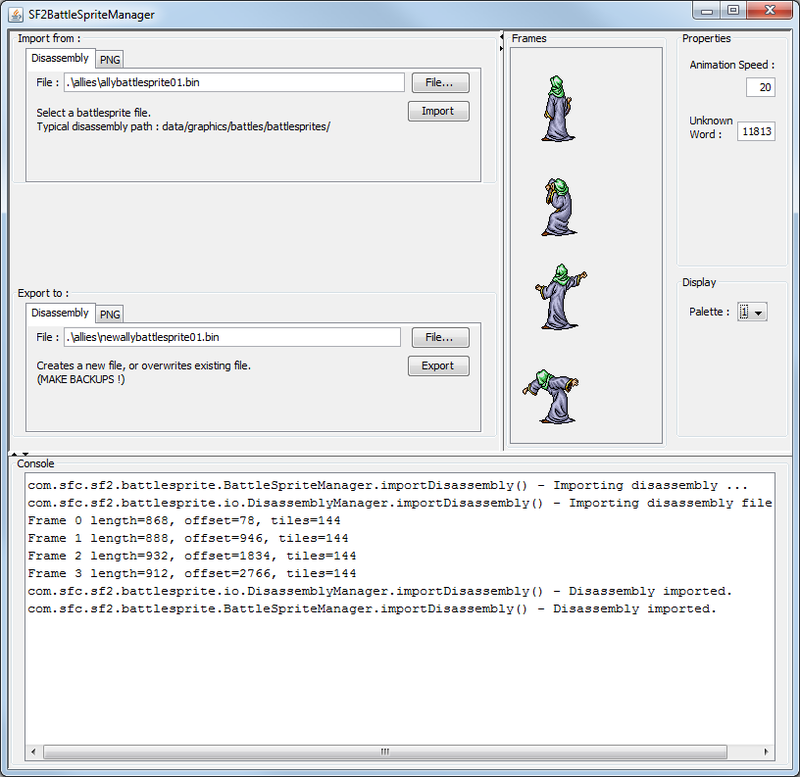 To manage new asset inclusion in the game, you can rely on the corresponding "entries.asm" file which should be in the same disassembly directory. Also, be aware that "WeaponSprite23" is only an ASM label, with no name or index computation. This is only a naming convention I set, so you can use more specific names if you want. Same goes for the binary files : it's just a basic naming convention, no need to follow it ! I believe that would be an easier way of manipulating new assets. Of course though, no matter the naming convention, the asset's index still depends on its declaration position in the pointer table. So "DiegoMMsAwesomeSwordv01" can be used in other data structures by pointing to it with index 23 ($17 in hex). Please tell me if anything is not clear enough, I'll try to develop my answers and share them as a more general documentation at some point, as this applies to most of the game's assets. Last edited by Wiz on Sat Sep 16 2017 5:20pm, edited 1 time in total. Not sure about what to do next. Editing spell graphics don't make much sense without extensive ASM programming so I'll put it aside for the moment. Maybe it's time to look further into maps, now ! Oh now I know ! I'm going to work on battle sprite animations !